David Cameron's education plans are practically the same as three years ago - and his headline measures on teacher training will make little or no impact. This morning, the Conservatives launched the second in their series of draft manifestos, this time focusing on education, ahead of Education Secretary Ed Balls’s Families Green Paper on Wednesday. The vast majority of the policy proposals contained in the draft manifesto can also be found in the Conservative’s 2007 Education Policy paper – a startling sign that nearly 3 years of deliberation has brought them no further in policy development. One of the small number of new policy announcements is the new entry requirements for teaching. The Tories rightly say that teaching should be an “elite profession”, but their policy prescription – for teachers to have a 2:2 in order to qualify for state funding – will have little to no impact. 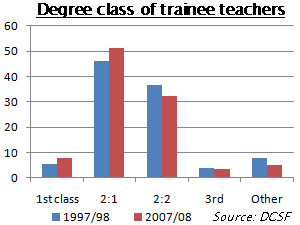 In 2007/08, the percentage of teachers with third class degrees in the first year of initial teacher training represented only 3.4 per cent of the total cohort, down from 4 per cent in 1998. In the same period, the number of those with first class degrees has increased to 7.8 per cent from 5.4 per cent and, for 2:1s, from 45.9 per cent to 51.4 per cent. In short, Labour in government has succeeded in attracting a higher calibre of graduate into teacher training. Noticeable also in Cameron’s speech was the absence of any reference to Swedish schools. Left Foot Forward highlighted some of the evidence against the Swedish Schools model in August and further evidence from the Trends in International Maths and Science Study (TIMMS) shows that England is ranked several places higher than Sweden in Maths and Science. What is clear from both these pieces of evidence is that while the Academy style schools in Sweden produce some gains, this is not replicated in the mainstream schools, which represent about 90 per cent of schools in Sweden), which have been left to suffer. A number of other suggestions in the manifesto document make disturbing reading. Once again, the Conservatives stress their commitment to “stop heads being overruled by bureaucrats over exclusions”. This first appeared in “Raising the Bar, Closing the Gap”, the Conservatives’ first policy green paper on education in 2007. The Conservatives propose abolishing the independent appeals mechanism for children who have been permanently excluded, instead making the school’s governing body the final opportunity for appeal. Abolishing the independent appeals process makes the process by which Head Teachers can expel pupils far easier and risks the loss of an important check on the processes followed by both Heads and Governors. It leaves open no mechanism for challenging these decisions, except through the courts. An option that would not be open to the families of most children facing permanent exclusion. In September, Left Foot Forward highlighted the Conservatives’ opposition to the Government’s new Vetting and Barring System. This morning’s announcements introduce more fears about the Conservatives’ stance on child safety as they propose to “make it easier for teachers to use reasonable force to deal with violent incidents and remove disruptive pupils from the classroom without fear of legal action and give teachers the strongest possible protection from false accusations”. It remains unclear how they intend to achieve this without weakening the protections afforded to children to ensure they are safe in school. As a teacher, I am always amused by the fallacy that is always propagated by the left and the right about the desire to have well qualified teachers in our schools, when in fact a degree grade doesn’t tell you anything about how good a teacher a person is going to be. I had a mentor in the second placement of my PGCE who entered the profession when it wasn’t necessary to have a degree, and she could, quite frankly, blow any Oxbridge educated and 1st bearing creature out of the water. Really, teaching, despite OFSTED and government’s ideas of what it should be, is a an art. Most adults educated to degree level (even if they got a third) could comprehend and learn what it would take to get a A at GSCE and A-level. However, the skill is translating this knowledge into a workable form so kids can understand it. The best teachers entertain, explain well, break down difficult concepts, empathise and manage learning and behaviour. This doesn’t show up in a degree certificate, and it’s sad that the Tories think it does. Well, I’m no expert but I would say that the teachers I found most inspiring when I was in my last year at school were the ones that I considered most intelligent. Rory; I remember finishing my A-levels at a large college with plenty of trainee teachers. Many did have first class degrees; but it was clear that alongside intelligence, it was being able to cope in classroom (and possessing the skills that Laurence suggested) that counted. These skills don’t necessarily equate with receiving a scholarly first. It was sad to see bright, but clueless, graduates suffer so much! Quite apart from this, there are questions over whether the quality of a degree is even a good predictor of teaching potential. Given the contents of that link, it might be better for Cameron to LOWER the standard, but have a greater churn, whereby new teachers were quite low paid, there was a high drop out rate, but those who made it could earn a pretty packet, which would then be the driver of a large number of people willing to take the risk and give it a go. I have a 2:1 in physics, and a PhD in physics too, but I will not qualify to be a teacher under Tory plans. The reason is that I have a C in GCE English ‘O’ levels. I wanted to be a scientist, so for me there were more important things to work on, like maths, physics and chemistry. Since then I have written 8 books (a quarter of a million words a piece, each one selling between 20,000 and 40,000) and several hundred articles in dead tree magazines, so my English (sorry “American”, because the magazines are mostly on the other side of the Atlantic) must be acceptable. It is a good thing that I don’t want to be a teacher.